Small Screen: New Girl, Same Old Tricks? Channel 4 has invested a great deal in hyping up its new sitcom, 'New Girl', which – after an initially promising start ratings-wise, has reportedly dipped significantly since the series opener. In spite of viewers apparently jumping ship in their droves, I think it’s worth sticking with – provided you enjoy quirkiness, spontaneous bursts of song and, perhaps most importantly, the comedy stylings of Zooey Deschanel. Created by Elizabeth Meriwether, writer of last year’s 'No Strings Attached', 'New Girl' doesn’t stray too far from the tried and tested formula that has proven wildly successful for other US sitcoms aired on Channel 4 – I refer here to 'Friends' and 'How I Met Your Mother'. It documents the everyday adventures of a group of wonderfully good looking twenty-somethings who live in a fabulous apartment, have convoluted love lives and hilarious mishaps. Deschanel plays Jessica ‘Jess’ Day, a kooky schoolteacher who has just emerged from a long-term relationship, after discovering, in a most unceremonious fashion, that her boyfriend is cheating on her. An emotional wreck, Jess is forced to search for a new apartment, and ends up moving in with three single men, all of whom fit the typical sitcom tropes we know and grudgingly accept. Schmidt (Max Greenfield) is the classic ‘himbo’ – egotistical yet insecure, unintentionally camp, a prolific womaniser, but ultimately a good guy. See: Joey from 'Friends'. Meanwhile, Nick (Jake Johnson) is the sarcastic, neurotic and belligerent but ultimately sweet and sensitive one (See: Chandler from 'Friends') and Winston (Lamorne Morris) is the archetypal Straight Man, the relatively normal one who marvels at the dysfunctional people around him – feel free to suggest suitable 'Friends' equivalent. 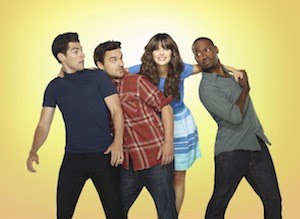 All this may seem a slightly damning catalogue of unoriginality, but 'New Girl' isn’t without its flashes of brilliance. The first four episodes have been consistently funny, which is due to the genuine comedy talent of the cast and witty, gag-heavy writing that’s peppered with zinging one-liners. Deschanel is thoroughly endearing as Jess, the ‘adorkable’ protagonist, and displays great delivery and timing on jokes, as well as a knack for physical comedy – the role has already earned her a BAFTA nomination. However, some may find the saccharine, wacky nature of her character to be something of a put-off. The series is still in its early days, so it will be interesting to see whether it diverges from the well-trodden C4 sitcom path as it develops – but at the moment it’s shaping up to be the new 'Friends' for the Facebook generation. 'New Girl' airs every Friday on Channel 4. Catch up on 4oD.